Thank you so much for all you kind words and notes you have sent from my last post, we feel grateful to have all as part of our extended family. Today, I am back with Deflecto and I am going to share with you a great idea for not only Valentines Day, but a gift you can create the whole year through with different themes. When I got married I wanted a pretty countdown board, something truly custom but not only was anything like this hard to come by in England, customized was out the window! So when Deflecto sent me this pretty pink frame and our theme was Valentines day, I just knew this was going to be perfect (although a little late for my big day!). Here’s my customized board…. Deflecto & Style Tech provided me with some product to create this project. The opinions I share are solely my own. 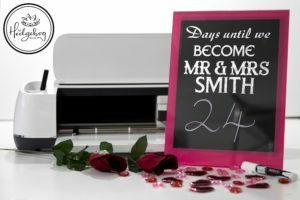 So many people get engaged around this time of year, so whether you are the bride to be; or you know someone is going to pop the question, or maybe you’ve been invited to an engagement party; this really is the perfect item. You could also do birthday, baby, christmas or any other celebration as a countdown. You can also get this in a variety of size and colors so its completely adaptable. I have added links at the bottom of the post. I also played around with what was best to write on the frame with, I found the Deflecto Chalk Marker was superb! Thanks so much for joining me today, I have a Valentines Day card for you tomorrow and I have taken a masculine slant as I don’t know about you but I always struggle with those?